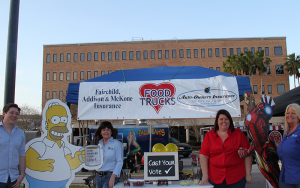 Lakeland Food Truck Rally – Brandon FL | Fairchild, Addison, & McKone Insurance, Inc.
What does Homer Simpson & Iron Man have to do with Food Trucks? Back in March we talked about a national study that revealed how most people did not understand the purpose behind life insurance. (Check out that blog here.) Our founder, James Fairchild, started this company with the purpose of creating a business that focused on educating the public to make informed decisions about insurance. We all know we need car insurance and homeowners insurance, but how many people really know and understand their coverages? When we realized how many people were misinformed about life insurance, we decided to use the basis of that study to start re-educating the public about life insurance. A large majority voted for Homer Simpson, contrary to the study performed by Life Happens. However, when asked why Homer was selected as the individual more likely to need life insurance, the reasoning was based on Homer’s personality versus his family, being the breadwinner, etc. The event was a great success – great food, wonderful people, and really, what else could you ask for? “FA&M gets it done! Responsive, Reliable, Competitive, and Competent.